Planning on suited up as Darth Vader or the equally diabolical Kylo Ren? If so, put yourself in their shoes both figuratively and literally by wearing the men's dark forces boots. These quality platform boots are a must-have accessory for anyone looking to step foot on the Dark Side this Halloween. The men's boots are crafted solely from man-made materials. 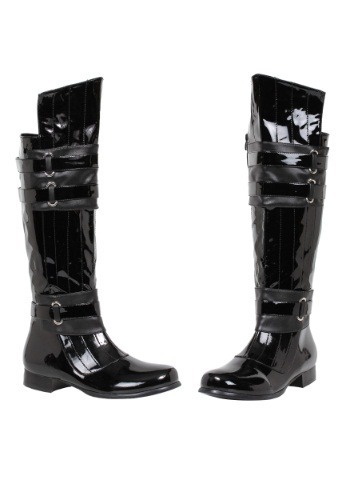 Decorative straps and silver embellishments decorate the boots while the faux patent leather creates a glossy, reflective shine. There's a textured sole featuring a 1-inch heel that won't create scuffs on hard floors. Also, they fasten via a hidden inner-zipper. These are boots that will allow you to take charge whether you're dressed as Kylo Ren or Darth Vader.